To Trollope or not to Trollope? Do you ever ask yourself this because 'To Trollope or not to Trollope' is a question I often ask myself and I wonder if others see Trollope as I do? Susan Hill has not one but two of the great man's novels in her list of 40 books so I don't think she'd know about this at all. For some inexplicable reason a read of an Anthony Trollope novel rarely seems to come to fruition unless I'm in search of a long seasonal read and want to set aside all else and dive into one book over a long holiday week. Then somehow I seem to talk myself right out of it again and remain un-Trolloped until the next time. I don't quite know what the problem is, perhaps I've come to it all too late in life. I've dabbled in the first three Barsetshires and done a bit of Pallisering in recent years, but sadly my heart doesn't do that little leap of joy at the sight or thought of a Trollope. So when a big fat package arrived from The Reader magazine containing my next surprise classic read for their Readers Connect page, (last time My Antonia by Willa Cather) I spent a fair bit of time wondering if I was in for a Dickens or a Dostoevsky when to my surprise out fell a Trollope...I won't reveal which one, but to my un-Trolloped mind it's less well-known. I can always be won over by a new volume of anything if I'm honest, who can dislike the arrival of a brand new book with an invitation to read it, rate it and comment accordingly. So despite the book's deceptive weight (hefty) I was pleasantly surprised on turning to the final page to discover it was a mere 400 or so pages long...how odd that it felt so much heavier than that. So I was quite relieved for about two minutes or so as I flicked through, except hold on what's this, halfway through another p400 quickly followed by another p1? Yes I'd been duped, it's that Trollopian classic, a book of two halves, 800 + pages and eek, I gulped. All was not lost because has anyone else been listening to Radio 4's Open Book and the Neglected Classics? Well-known writers have set off for the hustings, climbing onto their literary soapboxes to try and convince us why their choice of a Neglected Classic should win our vote. The result will be announced on November 7th, so still time to choose your favourite. I caught it on one of my Completer-Finisher afternoons and JoanneTrollope waved the family flag and advanced good, solid reasons for reading a lesser known Trollope novel, Miss Mackenzie (not the one I've been sent) and she sold it, and Anthony, to me most persuasively, hook, line etc. Duty-bound to read her illustrious ancestor as a child, Joanna Trollope cited this as one of the treat novels after a wade through some of the mightier tomes. The gold-diggers arriving to court Miss Mackenzie, the on-the-shelf spinster who suddenly finds herself in possession of wealth and in unaccustomed demand; a novel that Joanna Trollope argued would be eminently well-suited to the serialisation which will be the final accolade for the winner of the public vote. The suggestions have been varied and unusual but bless Michael Morpurgo for his choice, a favourite here too, The Snow Goose by Paul Gallico. Radio mention of each seems to have sent sales whizzing up the Amazon charts, I know those sales figures can be deceptive but Miss Mackenzie can't have been anywhere near the 485 it seems to be as I write this, with Susan Hill's choice The Rector's Daughter by F.M.Mayor, likewise now hovering at 294 and Colm Toibin's selection, Esther Waters by George Moore at 963. I feel sure they would all have been languishing down in the six figure doldrums for years until now. So I felt comforted, and thanks to Joanna, Trollopely re-energised and once I emerge from this year's Remembrance reading and get back into the groove I shall pick up...no, can't tell you what it is, with the same enthusiasm I always have for this little collaboration with The Reader magazine, and we'll see what happens next. These things go in threes don't they? Bookhound's computer had a fatal exception last week too, his motherboard now deceased so I donated him that lovely new computer of mine and now my desk looks slightly odd with two laptops on the go, one is the weak and feeble machine currently back from France, in Intensive Care and running diagnostics, the other (the Kayaker's spare) seems to be working fine, though I'm not confident. Now if you knew me you'd know this was an utterly ridiculous thing to even attempt, switch on, press F12 as soon as the logo appears and hit Dell diagnostics, then, well then what? The thing just won't boot up so it's currently running through all the permutations of possible reasons for this and so far that has taken an hour or more, but what happens if it discovers why? So far it's worked through caches, timers, system memory and IDE disk tests but worryingly seems to have skipped something called the IDE Disk S/N = MRLB55L4J9OXZC Confidence Test. I won't be able to do a thing about any it I'm sure but never mind, I can't get wound up about these things, it'll sort out I'm sure because it's all going off to a man-who-can tomorrow but there's me thinking I'll manage an e reader and associated technology? 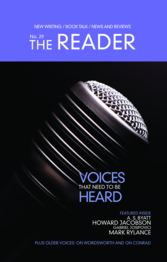 Meantime, while I'm bonding with my Sony e reader and this time I have read the instructions properly, (I never read instructions, I just plunge in impatiently and guess and then get it all wrong) why not find yourself a copy of the latest edition of The Reader? You'll be able to read Kirsty 'Other Stories' McHugh's great article Freedom to Blog, and then check out my spectacular failure with Rudyard Kipling's Kim in the Reader's Connect section. I just hated it, clearly wrong time wrong place for me, I couldn't connect with Kipling at all. My heart then sank a few feet further as Sons and Lovers by D.H.Lawrence arrived in the post to be read for the next edition, I haven't read much DHL but have inner prejudices based on heaven knows what that all made me think I'd hate him too. Wrong wrong and thrice wrong, what a revelation Sons and Lovers is proving to be. I am in 'absolutely just cannot put it down' mode and the bonus is it's on my e reader too. It's all made my day. 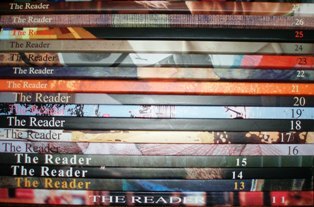 Good morning Liverpool and let me tell you I'm agog with anticipation over the latest edition of The Reader Magazine published by the English Department of the University of Liverpool and my copy is in the post. Number 29 harbours some amazing talent and then me. There's Mark Rylance the Shakesperean actor, Gabriel Josipovici, Howard Jacobson, Jane Davis, Joanna Trollope, lots about Joseph Conrad ...gasp A.S.Byatt and loads more besides...and then, well then on page ninety and lurking between Hayes and Jacobson in the List of Contributors there seems to be me. I had great fun writing a piece on my passion for reading groups of all descriptions, postal, online, face-to-face, and of course the best of them all, with apologies to all the others, The Endsleigh Salon. There was a problem with my photo which kept coming out blurry apparently and, though blurry is probably safer for the nation, Phil Davis eventually persuaded me to submit something useable. You can read Phil's editorial here and sense the excitement mounting around Liverpool as the 2008 Capital of Culture. 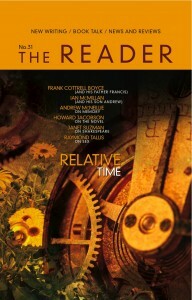 The Reader will be hosting a Literary Festival in November which is going in my diary right now. I'm hoping to take the blog out and about to a few literary festivals this year, the first was supposed to be Abingdon yesterday by kind invitation of Mark and Nicky at Mostly Books and sadly I was unable to go. I've had an unfortunate week of annual-leave-wrecking virus which like most viruses heads for your Achilles heel, in my case my Achilles neck, and then was knocked right off my perch by some new prescription painkillers. I have the constitution of an elf when it comes to drugs, being prescribed sufficient for an elephant was a recipe for disaster. If anyone needs to take out a stray elephant just ask me for details. However I think I owe it to my Liverpudlian inheritance to be there in this special year and what a great opportunity to explore all those places I grew up hearing about and was taken too but barely remember, Elswick Street where my mum was born, Matthew Arnold where she went to school, Sefton Park, the Liver Buildings. I may have been born in Devon and then grew up in London but by crikey a bit of our home was always Liverpool and the Mersey. Sunday Salon reading later I expect. Looking on my shelves I see I have been a subscriber to The Reader since edition number eleven (though number twelve's gone awol) and number twenty-seven has just arrived. It's a quarterly publication so as I'm still not Carol Vorderman, I'll let you do the maths, but it's been quite a while. I don't even remember how I made the discovery but it's been one of those very pleasurable acquaintances ever since and I mention it here with great regularity because I'd hate new visitors not to know about it. And live alone in the bee-loud glade"
The magazine is a not-for-profit endeavour based at the University of Liverpool and being half Liverpudlian I clearly have a divine right to an affinity.Editorship has passed from Jane Davis to husband Philip Davis and I can just imagine the kitchen table conversation if that was us...well I wouldn't have used that cover, colour's all wrong...hmm don't know why you made all that fuss about deadlines and said you didn't have time to do the ironing, I've mowed the grass twice. Actually Philip Davis single-handedly responsible for my current Bernard Malamud experiment and I can report that it's all going very well. Could his biography persuade me to read the novels? Well that's singing along too, a fascinating and, allelulia, a very readable book, so absolutely yes. One of the big attractions for me to The Reader was the ethos which I had never actually read in words but had sensed. This is an egalitarian, inclusive, very unpretentious reading magazine, they love books and they want to share the love of reading; every piece intelligently and thoughtfully written but not scarily so. "It is not academic, it is not arty, it is not preachy, it is not exclusive. But it is a magazine concerned with the direct effect of books on readers, with the human content and purpose of literature." How many literary journals have I subscribed to down the years and been bamboozled by academic waffle after the first few months? Jane Davis has moved on into the realms of reading as therapy and we share a great deal of common thinking on the health benefits of literature and reading. Fortunately Jane is pursuing tenaciously where the rest of us have given up in despair. Even better, and no excuse not to keep in touch, I see that there is now a Reader Blog and if you live near Liverpool check it out because you have some brilliant events in the offing, you lucky lucky people.I think a Devonshire annexe to the University of Liverpool is essential, twin the Tamar with the Mersey or something, they've both got ferries, that'll do. Cleverly with this edition the news that the next edition will have had a makeover, and if I want to see it it's time to renew my subscription. How typical is that? Jane's put up with those curtains all this time and in comes Philip and orders new ones. I just hope to goodness it all co-ordinates nicely with my collection.